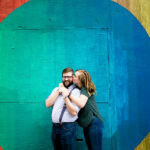 Ciara and Justin are getting married in Columbus, Ohio, but they live here and wanted to do their engagement session where their love story began—Austin, Texas is the wonderful city they call home. Since we meet many couples planning destination weddings or elopements, we offer a la carte engagement sessions even if we are not shooting their wedding. We enjoy capturing couples in every stage of life! This special couple brought their best pup friend along, and he was the sweetest thing ever. He loved getting in on the photoshoot, and looked like a model dog for sure. We always enjoy when couples bring their (well-behaved) pets because it helps couples relax, have fun, and showcase who they are as a couple with their four-legged family members. For this fun urban Austin session, we started off at the Long Center for the Performing Arts. The area around the building offers plenty of architectural diversity, geometric designs, and interesting backdrops perfect for some added aesthetics. Plus, you can see the beautiful Austin skyline in the background—a great way to document their history together. After venturing around there for a bit, the couple changed into chic button downs, and Ciara looked lovely in her red skirt and ankle boots. Next, they headed over the bridge into downtown to find some modern, romantic, and classy architecture to match their flawless style. I really like how Gia utilized the evening shadows from the lattice work in these images! Ciara and Justin were such a pleasure to photograph (and incredibly photogenic)! We’re so excited for them as they step out into the new adventure together. We hope you have a fabulous wedding day and wish you the very best!